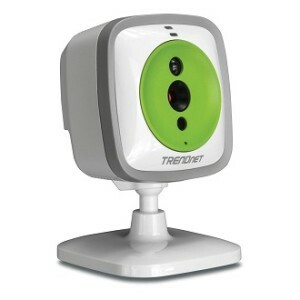 With the TrendNet TV-IP743SIC nanny cam you can monitor your baby anywhere, anytime so long as you have a WIFI connection. Just open a browser on a PC or laptop or even an app on your mobile device and you can view your baby in real time. TrendNet 3 year Limited Warranty. 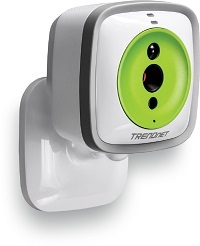 The built in sound and motion detectors of this TrendNet camera alert you to any changes at home. So if your baby wakes up and is unsettled, you will receive an alert notification on your iOS or Android mobile device (sound or motion detection) and you can talk to your baby or play one of the five preset lullabies to soothe them, regardless of where you are in the world. You even receive video clips with each notification so you can see exactly what is going on in the nursery or whichever room you have the nanny cam located. With this TrendNet WIFI Baby Cam you also have infrared night vision, so you can monitor your baby 24/7 and use the HD digital zoom (x4) to take a closer look at your baby as they are sleeping in their cot. Every parent needs the IR night vision feature on their nanny cam, otherwise you won’t be able to check on your little one during the night time from a remote location. Another great feature is being able to store real-time video in the cloud, so you can easily share your videos and snaps with friends and family. You will be happy to know that this service is free (unlike many other nanny cams that require a subscription for cloud storage). Cloud storage is a great feature, because if your nanny cam is stolen or breaks, all of your videos and special moments re still safe on the cloud. This model does not come with an SD card slot, but the TrendNet TV-IP745SIC model does have an SD card. WIFI: Home WIFI is essential for the setup and use of this nanny cam. Storage: Yes, FREE cloud storage of live videos. Two-way communication: Yes. You can hear and talk to your baby. Infrared: You have 16ft of night vision. Zoom: Digital zoom x 4. Installation: Easy installation using an app for your mobile device or login to the c loud for PCs. Email notifications: Yes, sound and motion alerts are sent via email with a snapshot. WIFI range: This depends on your own WIFI. Lullabies: Yes, the TrendNet baby cam plays 5 soothing songs. Video resolution: 640 x 480. Color images: Yes during daytime, black and grey at night. Cloud storage: Yes. You can automatically connect the TrendNet baby cam over the internet. Audio: Built in microphone and speaker. Software: Free Apple and Android apps. 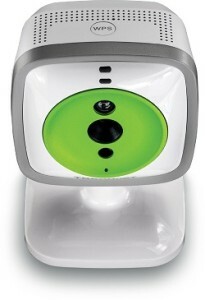 Setup: The TrendNet nanny cam comes with a quick start manual, a power adapter (5ft) and a camera mounting plate. This TrendNet security camera is compatible with IE 9.0 or above, Firefox 13.0 or above, Chrome 24.0 or above and Safari 7.0.3 or above. The other major difference is that the TrendNet TV-IP745SIC has an SD card slot for local storage and the TV-IP743SIC does not. Other differences are outlined in the table below. Since the TV-IP745SIC has more features than the TV-IP743SIC, it is more expensive – but not by much. So the main point of difference between these two nanny cams is that one has an SD slot and the other doesn’t. Both baby cams have a x4 zoom and play lullabies, but the TV-IP745SIC also has a temperature sensor. Neither camera has pan and and tilt functions. This means that if you are not worried about storing snaps or video, other than in the cloud, and a temperature sensor is not important to you, then the cheaper option might be best for your situation. The more expensive model also has a greater IR range during low light condition, better image resolution and a wider viewing angle. Online customer reviews for the TrendNet TV-IP743SIC are quite mixed with some customers loving this little nanny cam and others having lots of connectivity issues. On the positive side, customers do like the easy setup and the fact that they can talk to their older children remotely, while they are doing their homework or having their evening meal. They also like checking in to make sure their baby is safe and sound, the quality of the real-time images and the clear night vision. I love that this cam has great night vision, easy to see that they are okay, even in pitch dark. Overall, very happy with the system. Works better than I expected. It took me less than 15 minutes to get this set up to work with a Samsung Galaxy Tab 4 tablet. It was a bit tricky to set up, but I think that was because of how my home wireless was configured. Great quality for the price. Haven’t had any issues and simple to use. So far, there are only around 100 online customer reviews for these TrendNet cameras with around 50% being very happy with how they work. However, the TV-IP743SIC is very reasonably priced with the main difference between this model and the more expensive version (TV-IP745SIC) is that the other model has a SD card slot and a temperature sensor. So if you want an affordable nanny cam – either of these two nanny cams will do. If you aren’t fussy about storing images and video on your PC or anywhere else, then the cheaper model is fine. On the other hand, if you want to store videos locally, then you need the more expensive model with an SD card slot. The main problem I have with these two TrendNet WIFI cameras is that so many people have problems with the apps – connections seem to be difficult and keep dropping out all of the time. So whilst everyone loves the camera, the images and its functionality, it appears that the app for this camera is the main source of contention.